This is the first time I have used brass inserts to fasten parts in a 3D printed project. The idea is to use thermal power (heat) to sink these brass inserts into the plastic. This is done with a soldering iron and a steady hand. One of the things I wanted to accomplish was to mount an LCD display with its bezel flush to the top of a project box. I began by printing a bracket onto the bottom of the plastic lid. 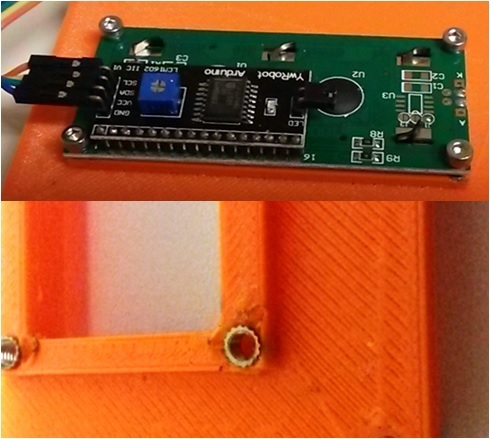 This provides a base for attaching the LCD printed circuit board. There is a hole in each corner of the PCB for an M3 screw. So, I designed matching holes into the plastic lid. The rectangular opening is just right for the display to pop through. Using a soldering iron, I heated four brass threaded inserts and pushed them into the plastic. When the material cooled, the inserts were solidly attached to the lid. It is necessary to figure out how much length or depth you need. In my case, I used 6 mm long M3 screws and 3 mm long inserts. The resulting fit was perfect. The inserts cost 10 cents each, and the screws 20 cents. The big challenge with using brass inserts is alignment. The screw and threaded insert need to both run straight along the same axis. Otherwise, the screw jams. Fortunately, you have a couple of chances to get it right. If you heat the insert a second time, you can move it slightly. While molten, the plastic will settle in place and then harden when you remove the heat. Remember the old saying: perfect is the enemy of good? Keep this in mind. I would love these 3D printed projects to be perfect, but that is a recipe for going crazy. My rule is about functionality and “good enough”.